(NewsUSA) - Sponsored News - Most people know her as the lovable, but no-nonsense nanny. In this way, Jo Frost brought a fresh, tough-love approach to parenting into American living rooms, all in the name of helping families. 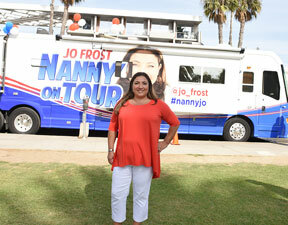 Now the acclaimed and internationally sought after caretaker of children and family advocate has partnered with UP TV to create "Jo Frost: Nanny On Tour." In the past, Frost focused on helping families with toddlers and elementary school-aged children; however, now Frost will concentrate on all stages of parenting from newborns and toddlers to tweens and teens. "This show is special to me because I concentrate on helping families with 21st century problems," said Frost. "Many associate me with naughty toddlers only; however, this show highlights how I have worked with families that include children from birth to teens, from grandparents to young parents and everything in between." Each week, Frost will address different concerns such as technology overload, sleep deprivation, single parent stress and blended family feuds. Through it all, Frost brings her familiar sense of sincerity, love and humor, as well as decades worth of experience and techniques to pinpoint each family's challenges and give parents practical tools they can use on their own. "We are thrilled to bring the foremost leader in fixing families back to American television in this all-new series expressly for and about families," said Amy Winter, executive vice president and general manager of UP. Throughout the season, Frost will travel across the country in her mobile RV office to a new city each week and work with one family that is in dire need of her expertise. In addition, Frost will travel into communities delivering expert advice and delivering quick fixes on the spot in places such as shopping malls, parks and town centers. Frost says the show has given a support system to families that have areas that need to be talked about because "family is our future and the health of a family is important to the future of America." "I'm just a woman who wants to reach out and help," said Frost. The series airs Thursdays at 8 p.m. EST exclusively on UP and is produced by Nanny Jo Productions. For more information, visit www.UPtv.com or visit Jo Frost on Twitter at @Jo_Frost #NannyJo or on Facebook at Jo Frost Official. Jo Frost tackles everything from technology to tantrums.